For the singer, see Edith Wilson (singer). Edith Bolling Galt Wilson (October 15, 1872 – December 28, 1961), second wife of U.S. President Woodrow Wilson, was First Lady of the United States from 1915 to 1921. She met the President in March 1915 and they married nine months later. President Wilson suffered a severe stroke in October 1919. 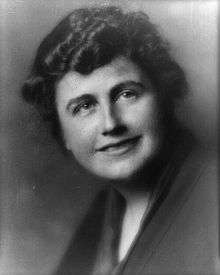 Edith Wilson began to screen all matters of state and decided which were important enough to bring to the bedridden president. In doing so, she de facto ran the executive branch of the government for the remainder of the president's second term, until March 1921. She was the first First Lady to assume presidential functions. Edith Bolling was born October 15, 1872 in Wytheville, Virginia to circuit court judge William Holcombe Bolling and his wife Sarah "Sallie" Spears née White. Her birthplace is a contributing building in the Wytheville Historic District. Edith was a descendant of settlers who came to Virginia early in the British colonization of the Americas. Through her father, she was a direct descendant of Pocahontas, the daughter of the chief of the Powhatan tribe of Native Americans and her husband John Rolfe, one of the earliest English settlers of Virginia and the first man to cultivate tobacco as an export crop. Rolfe's granddaughter, Jane, married Robert Bolling, a wealthy planter and merchant. Edith's great grandmother was a sister to Thomas Jefferson and she was also related to Martha Washington and Robert E. Lee. Edith was the seventh of 11 children, two of whom died in infancy. The Bollings claimed to have been quite wealthy prior to the American Civil War, but were forced to give up their plantation home after being unable to pay taxes on the land following the end of the war. After the Civil War, William Bolling settled on his father's property in Wytheville, where most of his children were born. The Bollings were staunch supporters of the Confederate States of America, and Edith was very proud of her Southern heritage. As was often the case with slaves freed after the war, the Bollings believed their former slaves were content with life on Rose Cottage Plantation and had little desire for freedom. After the Civil War William Bolling turned to the practice of law to support his family. The Bolling household was a large one. In addition to the 9 surviving children, Edith's two grandmothers, several aunts, and some cousins also lived with the Bollings. Most of these female relatives had lost their husbands during the war. Edith had little formal education, but that is not to say she was uneducated. While her sisters were enrolled in local schools, she was not. Her paternal grandmother, Anne Wiggington Bolling, played a large role in her education. Crippled by a spinal cord injury, Grandmother Bolling was confined to bed and it was the responsibility of Edith to wash her clothing, turn her in bed at night, and look after her 26 pet canaries. Grandmother Bolling also taught Edith to read, write, speak a hybrid language of French and English, make dresses, crochet, knit, and embroider. Furthermore, she encouraged an appreciation for poetry and music in the young girl and instilled in her a tendency to make quick judgments and hold strong opinions, personality traits Edith would exhibit her entire life. William Bolling read classic English literature aloud to his family at night, hired a tutor to teach Edith, and sometimes took her on his travels. During her childhood, Edith was particularly impressed by the songs and folktales she heard. Every day, the family gathered in Grandmother Bolling's bedroom and listened to her sing songs and tell romantic stories of people who found true love; these songs and stories also left a deep impression on Edith. The Bollings attended church regularly; Edith would be a lifelong devout Episcopalian. When Edith was 15, her father enrolled her at Martha Washington College (a precursor of Emory and Henry College), a finishing school for girls in Abingdon, Virginia; he chose it for its excellent music program. She was miserable there, largely due to poor food, cold rooms  and the rigorous, strictly-regimented routine. She returned home after a single semester. When she was 17, her father enrolled her in Powell's School for Girls in Richmond, Virginia; this, she later said, was the happiest time of her life. Powell's School closed at the end of the year after the headmaster suffered an accident that cost him his leg. Concerned about the cost of Edith's education, William Bolling refused to pay for any additional schooling for her, choosing to send her three brothers to school instead. While visiting her married sister in Washington, D.C., Edith met Norman Galt (1864-1908), a prominent jeweler; they married on April 30, 1896 and lived in the capital for the next 12 years. In 1903 she bore a son who only lived for a few days, and the difficult birth left her unable to have more. In January 1908 her husband died unexpectedly at the age of 43. Edith hired a manager to run the business and lived sparsely until she managed to pay off its debts. In March 1915, the widow Galt was introduced to widower U.S. President Woodrow Wilson at the White House by Helen Woodrow Bones (1874-1951), the president's first cousin and official White House hostess since the death of Ellen Wilson, the president's first wife. Wilson took an instant liking to Mrs. Galt and his admiration grew swiftly into love. In proposing to her, he made the poignant statement that "In this place, time is not measured by weeks, or months, or years, but by deep human experiences..."
Complicating matters were rumors that Wilson had been cheating on his first wife, or that he and Mrs. Galt had actually murdered the First Lady. Distressed at the effect all this might be having on his fiancée, Wilson offered Mrs. Galt the opportunity to back out of their engagement. She replied that she would stand by him not for duty, pity or honor, but for love. Edith also insisted on postponing the wedding until the end of the official year of mourning for Mrs. Wilson. Wilson married Edith Bolling Galt on December 18, 1915 at her home in Washington, D.C. Attended by 40 guests, the wedding was performed jointly by the groom's pastor, Reverend Dr. James H. Taylor of Central Presbyterian Church, and the bride's, Reverend Dr. Herbert Scott Smith of St. Margaret's Episcopal Church. The couple honeymooned two weeks in Hot Springs, Virginia and at The Greenbrier in White Sulphur Springs, West Virginia. 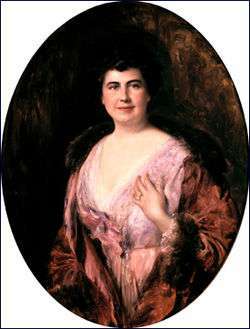 In 1916, the Swiss-born American artist Adolfo Müller-Ury (1862–1947) was commissioned by Colonel Edward M. House to paint a portrait of Mrs. Wilson, which he did in the White House. The painting always hung in the President's bedroom, but when Mrs. Wilson died she left it to the White House, and a copy was made to hang in the Woodrow Wilson House Museum. 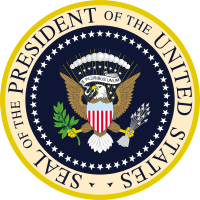 Though the new First Lady had sound qualifications for the role of hostess, the social aspect of the administration was overshadowed by war in Europe and abandoned after the United States formally entered the conflict in 1917, and she became the first person besides the President to receive permanent full-time Secret Service protection. Edith Wilson submerged her own life in her husband's, trying to keep him fit under tremendous strain. She accompanied him to Europe when the Allies conferred on terms of peace, the first such trip for a U.S. President while in office. Following his attendance at the Paris Peace Conference in 1919, Wilson returned to campaign for Senate approval of the peace treaty and the League of Nations Covenant. However, at the age of 62, his health failed in October, when a stroke left him partly paralyzed. The United States never did ratify the Treaty of Versailles nor join the League of Nations, which had initially been Wilson's concept. At the time, isolationist sentiment was strong. 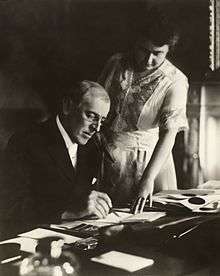 Edith Wilson took over many routine duties and details of the Executive branch of the government from then until Wilson left office almost a year and a half later, on March 4, 1921. She decided which matters of state were important enough to bring to the bedridden president. "I studied every paper sent from the different Secretaries or Senators," she wrote later of her role, "and tried to digest and present in tabloid form the things that, despite my vigilance, had to go to the President. I, myself, never made a single decision regarding the disposition of public affairs. The only decision that was mine was what was important and what was not, and the very important decision of when to present matters to my husband." One Republican senator labeled her "the Presidentress who had fulfilled the dream of the suffragettes by changing her title from First Lady to Acting First Man." In My Memoir, published in 1939, she called her role a "stewardship" and insisted that her actions had been taken only because the president's doctors told her to do so for her husband's mental health. Some historians take issue with her version of events, such as journalist Phyllis Lee Levin. She wrote that Edith Wilson was "a woman of narrow views and formidable determination." In contrast, Joseph P. Tumulty wrote "No public man ever had a more devoted helpmeet, and no wife a husband more dependent upon her sympathetic understanding of his problems...Mrs. Wilson's strong physical constitution, combined with strength of character and purpose, has sustained her under a strain which must have wrecked most women." In 1921, Edith Wilson retired with the former president to their home on S Street NW in Washington, D.C., nursing him until his death three years later. She later served as director of the Woodrow Wilson Foundation. She headed the Woman's National Democratic Club's board of governors when the club opened formally in 1924. Her memoir appeared in 1939. When Franklin D. Roosevelt went to Congress on December 8, 1941 to ask for a Declaration of War after the attack on Pearl Harbor, he took pains to draw a symbolic link with the April 1917 declaration of war. Mrs. Wilson accompanied him. In 1961, she attended the inauguration of President John F. Kennedy. She died of congestive heart failure at age 89, on December 28, 1961, on which she was to have been the guest of honor at the dedication ceremony for the Woodrow Wilson Bridge across the Potomac River between Maryland and Virginia, on what would have been her husband's 105th birthday. She was buried next to the president at the Washington Cathedral, but has since been re-interred elsewhere in the cathedral's crypt. Mrs. Wilson left her home to the National Trust for Historic Preservation to be made into a museum honoring her husband. The Woodrow Wilson House opened as a museum in 1964. To the Library of Congress, Mrs. Wilson donated first President Wilson's presidential papers in 1939, then his personal library in 1946. The Edith Bolling Wilson Birthplace Foundation & Museum in Wytheville, Virginia was established in 2008. The foundation has managed to stabilize the First Lady's birthplace and childhood home which was named by Preservation Virginia as an Endangered Historic Site in May 2013. The foundation's programs and exhibits aspire to "become the conduit by which public awareness will be built honoring Mrs. Wilson’s name, the contributions she made to this country, the institution of the presidency, and for the example she sets for women." In 2015, an old bank building in Wytheville, Virginia located on Main Street was dedicated to the First Lady and bears her name. The Bolling Wilson Hotel serves Wytheville, Virginia residents and travellers alike. The Foundation shares First Lady Mrs. Wilson's journey "From Wytheville to The White House". 1 2 3 4 5 6 7 8 Schneider and Schneider, p. 191. ↑ "Person Details for Edith Bolling, "Virginia Births and Christenings, 1853-1917" —". Familysearch.org. Retrieved 2016-09-07. ↑ Pezzoni, J. Daniel (July 1994). "National Register of Historic Places Inventory/Nomination: Wytheville Historic District" (PDF). Virginia Department of Historic Resources. 1 2 Hatch, p. 42. 1 2 3 4 5 Mayo, p. 170. 1 2 3 4 McCallops, p. 1. 1 2 3 4 5 6 Gould, p. 237. 1 2 3 4 5 6 McCallops, p. 2. 1 2 McCallops, p. 3. ↑ Creeden, =Sharon (1999). In Full Bloom: Tales of Women in Their Prime. August House. p. 30. ↑ Klapthor and Black, p. 65. ↑ Rowe, Abbie. "Inaugural Parade for President John F. Kennedy". JOHN F. KENNEDY PRESIDENTIAL LIBRARY AND MUSEUM. Retrieved 14 December 2013. ↑ Ginsberg, Steven (July 15, 2006). "From Its Hapless Beginning, Span's Reputation Only Fell". Washington Post. Retrieved 2012-05-11. ↑ "The Foundation History". Edith Bolling Wilson Foundation and Museum. Retrieved 5 October 2015.